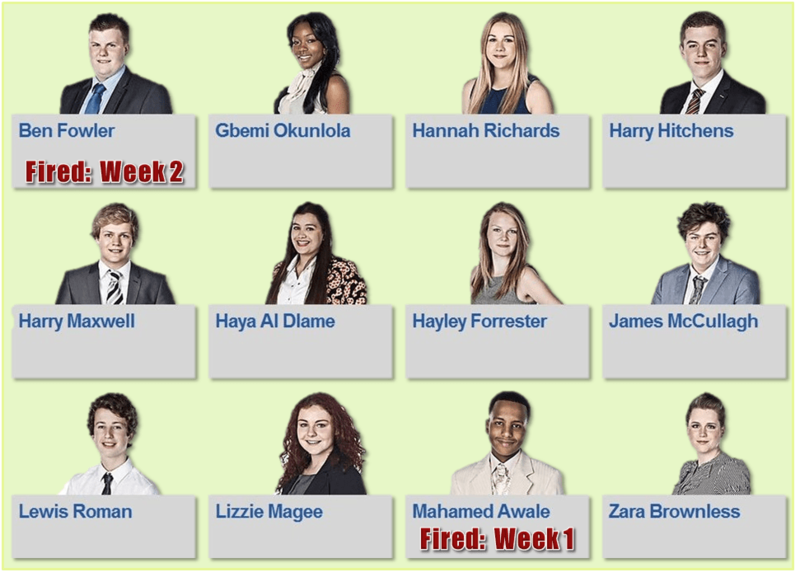 There was a lot of interest to pick out of last nightï¿½s Young Apprentice, so letï¿½s get the facts out of the way. The teams, Atomic (a slightly depleted boysï¿½ team) and Kinetic (the girls) were set the task to come up with an innovative product for the parent and baby market and pitch is to three leading retailers: Mothercare (the global retailer), JoJo Maman Bebe (the niche retailer) and John Lewis (the department store). The teams chose Lewis Roman to lead Atomic and Gbemi Okunlola to lead Kinetic. The look on Nickï¿½s and Karrenï¿½s faces!ï¿½ But come on: how many parents can honestly say that, at a bad moment, that very thought never crossed their mind?ï¿½ Maybe itï¿½s just me.ï¿½ Suffice to say, I never knowingly took that particular shortcut. What we saw of the brainstorming and design process for Kinetic (the girls) went very smoothly.ï¿½ Quickly they alighted on a padded arm / baby sling for small babies.ï¿½ It was in selecting the models for the family grouping that it all went wrong, as the girls fell out over the obvious incongruence of white dad, black mum, white and fair baby.ï¿½ But here, Iï¿½m going to disagree with Lord Sugar: itï¿½s a non-issue ï¿½ or should be.ï¿½ Mixed race families with adopted babies may not be an everyday sight, but they are common enough.ï¿½ Iï¿½m with Zara on this one: the models all looked nice and the photos were strong.ï¿½ The girls didnï¿½t need to fixate on it and what we saw was tribalism between the two subgroups. But that was nothing to the two rutting staglets that were James (McCullagh) and Harry (Maxwell).ï¿½ Every idea one had, the other rubbished.ï¿½ Teenage testosterone filled the studio and the store, with each fighting for the last word.ï¿½ Harryï¿½s idea prevailed, but James won, with a bombastic style that left me horrified.ï¿½ He won, because despite losing the argument, Harry came out disliked by all the boys and ended up in the boardroom.ï¿½ I thought Harry M was strongly defending a good point: the teamï¿½s Hippo-styled bottle holder was more marketable for its friendly-cuddly novelty than for its heat retaining properties. In both teams, the project managers took the role of leading their first presentation.ï¿½ There is no kind way to say it: both Lewis and Gbemi were bad. Very bad. I saw no evidence of rehearsal at all, and this must be a major contributory factor.ï¿½ Both stumbled over not just how to articulate their message, but what their message was.ï¿½ Neither seemed in the least aware how bad they were; Lewis remarking that he thought his pitch went ï¿½really wellï¿½.ï¿½ It didnï¿½t, Lewis.ï¿½ In neither team did someone have the courage to look the project manager in the eye and say: ï¿½that was bad; letï¿½s try someone new.ï¿½ï¿½ So we saw the car wrecks again, with another retailer. Then they got it.ï¿½ Harry Hitchens did the boysï¿½ third presentation and Haya Al Dlame did the same for the girls ï¿½ both to Mothercare.ï¿½ Both had thought through their pitch and, whilst Harry showed the more natural style, Haya was clear and measured.ï¿½ Both did very well. I thought Harry H was one to watch last week and am now already convinced he could go all the way.ï¿½ Haya was quiet through much of the first two episodes, so I shall reserve judgement on her, but I do think Zara Brownless showed some strengths tonight ï¿½ although I suspect that she, like Harry M, may not be popular with her team.ï¿½ Happily, there will need to be a shake up next week. What Happened in the Boardroom? Kinetic won and got a dance class in street dance.ï¿½ I couldnï¿½t help thinking that it may have been wasted on the boys and yes, I do know that I just admitted to a prejudice. I think it will have come as no surprise to anyone that Lewis brought Harry M and Ben (Fowler).ï¿½ In the cafe, they had turned on Harryï¿½s constant making of his point as a point of treachery, and on Benï¿½s near absence from the task as an easy target.ï¿½ Indeed it was.ï¿½ Once again, Lord Sugar showed his disdain for passengers and fired Ben.ï¿½ I think Lewis was lucky to get away with it.ï¿½ Letï¿½s examine why he, and Gbemi, performed so badly. Both project managers failed badly in selecting themselves to present without considering alternatives and then performing badly.ï¿½ Why?ï¿½ I propose that it was a perfect storm of five factors, that coincided with a dire lack of preparation and rehearsal. a costly place to win that awareness. find out quickly when you are wrongï¿½ and make changes. Factor 5: The control fallacy that leads us to feel risk is minimised when we are in control. The best way to control the presentation is if ï¿½Iï¿½ do it. the role and conducting rehearsals. We have seen too little of some of the girls, to be confident of who is strong and who is weak, but both Harryï¿½s look strong to me at this stage.ï¿½ As is often the case with teenagers, the girls are looking the more mature, but I wouldnï¿½t like to draw conclusions yet, but Lizzie Magee needs to take care she doesnï¿½t make Benï¿½s mistake.